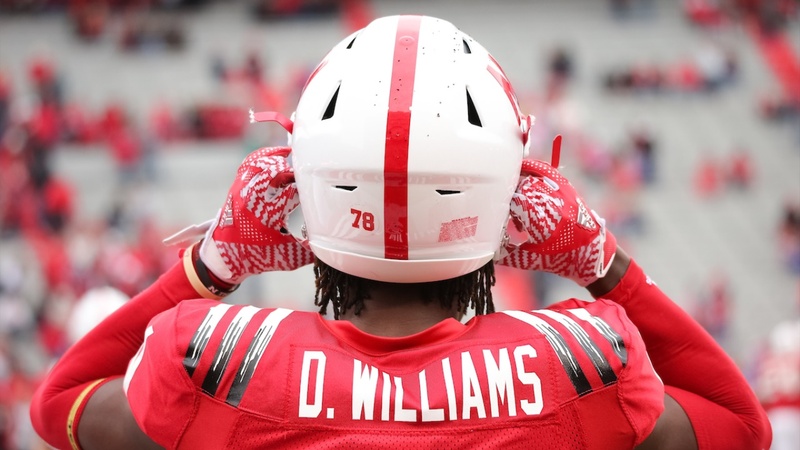 Throw It At Nebraska DB Deontai Williams. Please. He Wants You To. Is Jaron Woodyard – a guy with a pretty respected reputation for speed, a guy whose Twitter handle is “Speedyy8” – faster than Mike Williams? “No,” Williams shot back when asked. What about Deontai Williams? Mike knows. They’ve tangled already in fall camp. “He brings a physicality that some guys have and some guys don’t,” Mike says. And if you don’t know about the transfer safety from Jones County (Mississippi) Community College by now, you will soon. Three guys in the defensive backfield are referred to as the GOAT: corner Dicaprio Bootle, safety Tre Neal and Deontai. “He’s going to be a big part of our defense this year," Bootle says of the sophomore safety. This is a guy who listens to Bob Marley before he steps on the football field to relax his mind. “If I’m relaxed on the football field and I feel confidence in what I’m doing, I can just go out there and play,” he says. This is a guy who, once on the field, plays with a game that would probably be the exact inverse of a Bob Marley record. He’s quick, aggressive and violent. That hit was on a 6-foot-4, 260-pound, tight end named Jack Stoll. A 6-foot-1, 200 pounds, Williams de-cleated him. Because that’s how he plays. That’s what earned him GOAT status before even playing a game for Nebraska. Mike Williams had to block him in practice last week and neither backed down. Then, later, when Mike’s gloves were wet and he needed a towel to wipe them off, Deontai refused to share his. Fisher played NFL ball with Deontai's dad, Roosevelt Williams, a corner and third-round pick in the 2002 NFL Draft. Fisher is quick to point out Deontai is not his father, he’s something else entirely. With all the competition in the secondary, that’s a pretty significant development. Especially considering the Huskers return one starter from last year’s team in Aaron Williams and added another starter from this staff’s Central Florida defense last year in Neal. There’s also Antonio Reed, JoJo Domann and Marquel Dismuke fighting for playing time. Which is fine. He’s used to that. You just want to put fear in the offense, you feel me? Put fear. Like, ‘Watch [No.] 41 right there. When Deontai was coming out of high school in 2015, six of his teammates were ranked inside the top-100 Florida prospects by the 247Sports Composite. Those guys pushed him day in and day out. He says Reed and Neal are pushing him now. Deontai can also be a little too hard on himself. One mess up and he tells himself he’s average, so he has to go out on the next rep and prove himself all over again. He’s a self-admitted sore loser, so he doesn’t lose. “I’m not trying to be the best, I’m trying to be the greatest,” he said. “Get better and better every day, so whatever helps me get better and better … There’s no fear. I’ve played football for so many years now there’s no fear. Football is like a playground for me. One picture that still needs a bit of work is the Huskers’ starting secondary. Deontai figures to factor heavily into that. Last he met with the media, he said Neal and Reed were leading Fisher’s production chart at safety but were each only a single point ahead of him. Everyone pays attention to the chart. It’s not one of those things where you just “block it out and focus on the field,” because everything done on the field directly impacts the chart and the chart directly impacts what they get to do on the field. The top guys will start. Fisher has made the question pretty easy. Deontai is making Fisher's answer complicated. In this case, Fisher is talking about being a vocal leader for his defense. Deontai is growing into such a role. He has no issues, however, talking to the offense. Yeah. Watch No. 41 this fall.